No kidding, Stanford researchers actually showed it’s possible to cool solar panels by applying a special coating that reflects some of the heat back into space. The coating, called a photonic crystal cooling system, is transparent. This allows the light to reach the PV cells so these can generate energy, but – crucially – some of the heat is reflected back in space. It’s so good that the researchers showed their PV panels can even stay below ambient temperature, which is incredible by itself. If you know a thing or two about solar panels, then you’ll remember their efficiency is directly related to temperature. The cooler a panel is, the more of the sun’s energy it can convert into electricity. And we’re talking about a mere coating, which shouldn’t be too difficult to scale. Bit by bit, you if you multiply the extra efficiency by millions of panels you end up with a huge useful energy gain. This may be a game changer. Previously, the same team at Stanford made headlines after their turned cooling upside down. A radiator is the most basic cooling part and implies transferring the heat out of your system, to the ambient. Take your refrigerator, for instance. It uses energy to cool food inside, but it also release heat into the room its kept, which is then absorbed and released outside and so on. Same with a car, where a simple grilled metal part stays in contact with both the engine and the air to move away the heat. What’s innovative about the new solution developed at Stanford, however, is that heat is thrown out of the planetary system itself. The heat literally ends up in outer space. 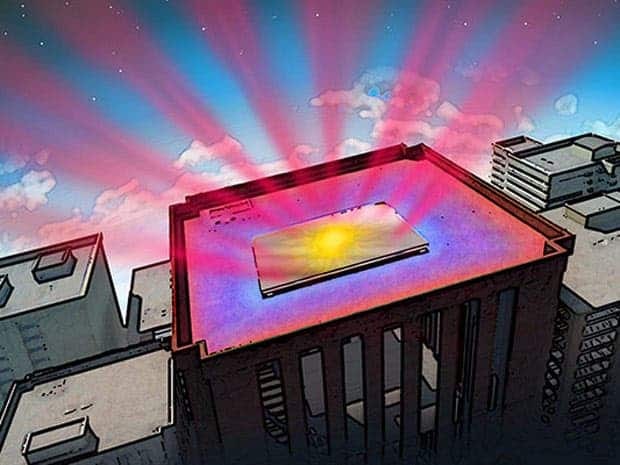 When they first showcased their passive cooling prototype, the researchers reported they could lower the temperature of anything that it’s placed on by up to five degrees Celsius by absorbing heat, then re-emitting it at an infrared frequency which can pass through the atmosphere. This way, you use the Universe as a heat sink. Brilliant. 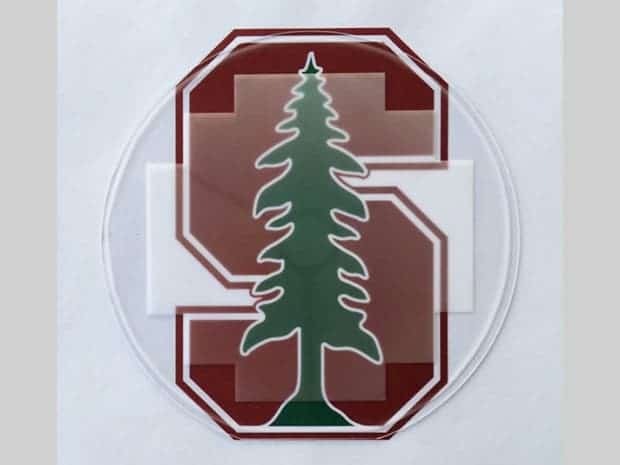 The silica coating over a the Stanford logo. The researchers were interested, however, in making this work for solar panels, but their initial prototype also reflected 97% of the sun’s rays which is obviously impractical for solar power generation. Now, they’ve found a workaround: they’ve designed a thin film of pattern silica which is transparent to visible light, which makes up most of the energy that solar panels use, but essentially absorbs infrared light (heat). In the paper published in PNAS, the researchers report cooling a solar panel layered with such a film by up to 13 degrees Celsius, which is huge! In terms of efficiency, this translates in increased performance of at least 1% in absolute efficiency. All matter dissipates heat under the form of far infrared waves, be it rocks, trees or cells. Humans, at normal body temperature, radiate most strongly in the infrared at a wavelength of about 10 microns, which can be viewed with special thermal vision goggles. Heat is dissipated in wavelengths between 6 and 30 micrometers, but air molecules can only absorb, and thus emit, heat in the lower and upper range. Anything that’s between 8 and 13 micrometers passes right through the air and into space. So the trick lies in building a surface that reflects lower and upper ranges, while radiating microwaves that can’t be absorbed by air. The polished fused silica coating is very thin, only 500-μm thick, and patterned with of 6-μm wide, 10-μm deep holes. In the lab, it was etched using photographically which doesn’t sound too practical for large scale but other manufacturing methods could be used.